If you’ve ever looked back so fondly on a gadget from your childhood that you wanted a tiny representation of it for your shelf, 2018 is the year for you. Never before has there been so many options for tiny functional electronics. Whether you need a tiny box that plays Mario or a computer mouse that fits in your pocket, you can reward your obsession with the small. Now, we can add 80s computing to the mix. 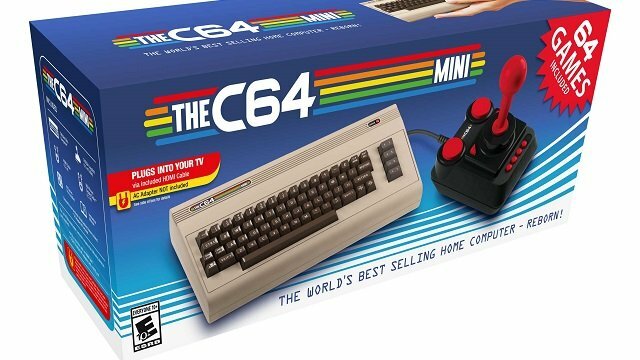 The C64 Mini computer is ready to bring modern users back to the days of BASIC. Since gaming dominates this space, it’s only natural that the C64 Mini has plenty for you to play. Games like Boulder Dash and Speedball II: Brutal Deluxe may not be technical powerhouses today. However, there’s still some fun to be head in the arcade days of yesteryear. Of course, if you’re not used to Commodore 64 gaming, you’ll have to get acclimated with its controller. Back in the day, you went without rumble and D-Pads. You’ll be playing with a joystick and big red buttons, and you’ll like it. While it primarily pitches itself as a games machine, the C64 Mini is more interesting than that. Sure, it comes preloaded with sixty-four classics of the era, but it also fully functions as a Commodore 64. Putting your coding skills to the test is as simple as plugging in a keyboard and selecting the BASIC option from the console’s menu. If you still have programs from the era lying around, the C64 Mini will load them just fine as well. You’ll just need to add them yourself using the device’s USB ports and a flash drive. There’s a bit of a process to go through as of now, but the hardware manufacturers promise that a simpler program loader is coming in a future update. Whether you want to code or play, the C64 Mini should provide a fun trip back in time. You can grab the minicomputer from Amazon or Wal-Mart for $79.99. For even more information, check out what our reviewer thought over on Game Revolution.